I think they said it hailed from Nevada. Does anyone have experience with this stone? Thanks. I think I have a few of these myself, but tbh, I haven't (or don't recall) doing much of anything with them. My bad thing is, that I often forget which crystals are what--and I have MANY black crystals. I do try often to put a sticky label - small if req'd on the crystal with its name--but many of them end up falling off, thus the issue at hand. Now, I wish I had taken its picture with a paper beside it giving its name and properties. This is one thing I tell myself I am going to do from now on! Keep us posted Linnie. I'd be interested in knowing how to work with it and what all it offers to you. I have a tumbled piece. They are fairly rare to find. I don't think they've found any in Nevada. I'm fairly certain they've only been found in Colorado. Native Americans have been using the stone for journeying for a long time now, but the stone is relatively new to the crystal community. I use it for shamanic journeying, and it has been pretty effective in helping me to be more aware and present when going to the underworld. I like to use it in conjunction with Iolite, Nuummite, and Indigo Gabbro which really helps me to get more from the experience. Keep in mind that this synopsis was written by Robert Simmons, who is the person who introduced the stone to the crystal community, named it, and is selling it for profit, so take it as you will. I feel his summary is accurate but heavily embellished. Hope that helps. Let me know if you have any other questions. oooh! thank you, beancrew for the link and your post. Very interesting. and, now, after reading that link, beancrew, I remember that I purchased it solely to help me with journeying and ancestor and guide communication. I can't recall however, if I used it ever. I also sadly can't tell it from the OTHER black stones I have. *sigh* I also purchased this for its ability of protection against negative forces. like most of the other black stones I have. You're very welcome. It can be hard to find information about this stone since it is so "new". I've not seen it in its crystalline or raw form, but when tumbled it has somewhat of a white-waxy mirror-like quality to it compared to most of the other black grounding stones (except for obsidian of course). It's appearance is unique in a way so maybe you can compare your pieces to pictures or videos on the internet. I think a sphere would be a perfect way to utilize this stone, as I find spheres are very conducive to meditation. Yes, thank you! I'll try to do that. I have a lot of obsidian as well. Love it! Yes, I'd never even heard of it until I arrived at last month's gemfest, and was immediately taken by the name, of course. It is a very dark charcoal colour, CN, but as beancrew mentions, it feels waxy, like some of the other calcite stones... Mine is an irregular flat triangular shape about 2' x 1.5" that fits between my thumb and palm, and would be uncomfortable except that it is slightly rounded on its edges and the silky waxy feel softens it and makes it easy to flip over in my hand. I know that when both myself and a close friend hold it, we can both feel a tingling and buzzing energy that feels powerful and enhancing. Shamanite™ black Limestone/Calcite with a few fossils in it. Master Shamanite™ "Garden variety black Limestone/Calcite with a few fossils in it. Nothing about it, such as fossils or trace minerals like Strontianite and Zircon, is unusual. The commercial value of this stone is a few cents, but it is sold for 10's of dollars. Clearly a scam." Note: I find it interesting that Shamanite is trademarked by a company in Florida. 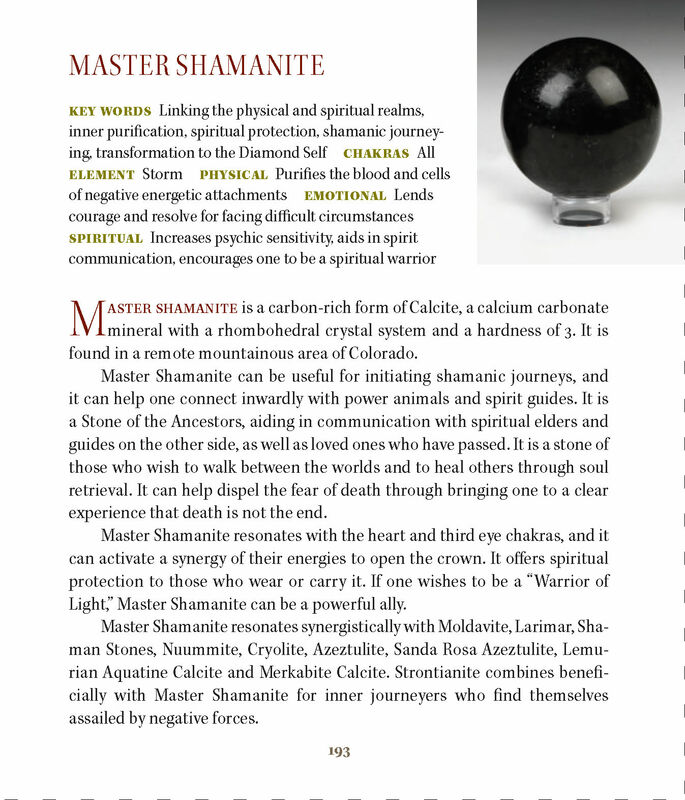 However, Robert Simmons shows a trademark on his name, Master Shamanite, as well. I found nothing in any trademark database that proves he has trademarked the name Master Shamanite. Black Calcite is actually pretty rare. Just because it's composition is made up of some common materials, that does not make the whole common. As far as I know, the only place in the world it's found is in Colorado. As a person who can sense crystal energy, I can say with absolute surety that is holds a unique energy. In the end, the true value of Black Calcite is what you determine it to be. If you like to journey to the underworld I find that it's one of the more valuable stones to take with you. Can you put a price on that? What is it? That's all up to you. I totally agree with how absurd it is to trademark a naturally occurring mineral... I mean, what gives anyone the right, yes? Conversely, had it not gone by a name that caught my eye, I may have passed it, as it is simply impossible to see, touch, feel the energy of every stone, even spending all day (which I do, sometimes even all weekend! ), at Gemfest.